Quality and Effectiveness: Users have the option to control the XJ-UT351WN, one of Casio’s latest family of short-throw projectors, with a phone or other mobile device via a wireless adaptor. The projector uses a lens and mirrors instead of a lamp, and it crisply illuminates up to 3,500 lumens on a 50” to 110” space without shadows. Because it’s lamp-free, this projector has an extremely long life of 20,000 hours, or approximately 18 school years. In addition, this projector is ready to use within five seconds of being turned on and requires no cool-down time since there are fans to cool the projector. Ease of Use: This projector is easy to connect and use. The remote control, with its standardized, easy-to-recognize buttons, can be used for every projector function. Casio provides a detailed, 65-page installation and operating manual online. I only needed to use the manual to learn how to change the input ratio to maximize the bright image. Creative Use of Technology: Casio’s ultrashort-throw projectors include light sensors so the lumens displayed automatically adjust to the room. 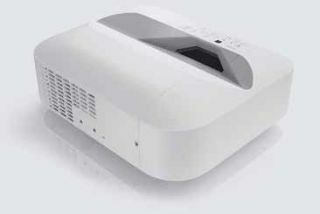 Teachers can also control the projector’s light-source brightness manually, on a range of one to seven. By default, images are displayed in the standard, 16 x 10 aspect ratio, but teachers can modify that ratio as needed. The projector also includes a 16W speaker, which has enough power to reach all corners of the room. Suitability for Use in a School Environment: The Casio short-throw projector can be integrated smoothly into any school setting. Teachers will appreciate the control they have with this model, as well as the ability to share content from a phone or other mobile device. Administrators will appreciate the projector’s expected 20,000-hour life and the savings associated with not having to replace bulbs, as well as the built-in light sensor to save even more money on electricity costs. An anti-theft port is built into the projector housing so that an anti-theft chain can be connected. Because the Casio XJUT351WN ultra-short-throw projector uses a lens and mirrors instead of a lamp, users can turn it on quickly, and it’s quiet and efficient, with an expected 20,000-hour life. This model displays a brilliant image with up to 3,500 lumens, and with its built-in light sensor the projector saves money in addition to providing the best display for the conditions in any given room. ● Has a very long life—up to 20,000 hours, or about 18 school years. ● Will save schools money on lamps, filters, replacement labor costs, and recycling fees. ● Brightly displays 3,500 lumens on 50” to 110” screens or wall spaces.